Vandenberg AFB is a space and missile testing base located close to Lompoc, California. The host unit is the 30th Space Wing of the Air Force Space Command. The mission on base is to place West Coast satellites into orbit. The 30th Space Wing also maintains the Minuteman III Intercontinental Ballistic Missile Force Development Evaluation program. 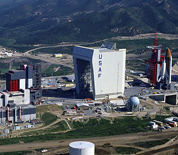 The Space and Missile Heritage Center is located at the Space Launch Complex 10, a National Historic Landmark at Vandenberg. The Center houses exhibits depicting the evolution of missile and space activity on base. This Vandenberg AFB directory features the critical info you’ll need to navigate through the many facilities and recreational opportunities available on base.